The full member of RAS (1994), corresponding member of AS USSR (1976), doctor in physics and mathematics (1966), full professor (1968). Mathematician. A professional in the field of the theory of differential equations, mathematical physics, calculus mathematics, mechanics of continuous media, numerical methods of linear algebra. He was born on July 17, 1929 in Moscow. He graduated from mechanico-mathematical faculty of the Moscow State University (1951). He worked in V.A.Steklov Mathematical Institute of AS USSR (since 1951); junior, senior research associate, the head of a department (since 1953) in the Branch of Applied Mathematics of the same institute (from 1966, M.V.Keldysh Institute of the Applied Mathematics). Coincidentally with this, a scientific adviser in secure facilities (1957-1958, 1964). A teacher of the Moscow State University (1952-1960, assistant, senior lecturer, the full professor). Since 1969 in the Siberian Branch: the head of a laboratory of the Computer Center of SB AS USSR (1969-1980); the head of a laboratory (department) (1980-2000), the Vice Director (1981-1983), acting director (1983-1986) of the Institute of Mathematics of SB AS USSR (nowadays S.L.Sobolev Institute of Mathematics of SB RAS). The adviser of RAS (since 2000). The teacher (1969-1997), the head of a sub-faculty of differential equations (1979-1990) in the Novosibirsk State University. The founder of several new scientific avenues that unite the theory of hyperbolic equations with hydrodynamics and the elasticity theory, difference methods for the solution of differential equations and mathematical physics, linear algebra and problems of thermodynamics of continuous media. He has proposed a method, which was called by him afterwards, to perform numerical solution of stationary many-dimensional problems of gas dynamics using the establishment process for a nonstationary stream, whereby a wide class of problems for stationary flow has been solved. 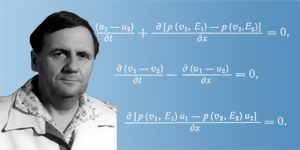 He has made a significant contribution to the development of calculation methods for critical parameters of nuclear reactors, having suggested for this purpose using the orthogonal prorapid motion method that had later a widespread occurrence in diversified problems. Widely accepted were his results in the development of general theory of difference schemes to solve differential equations. He participated in creation of the mathematical theory of the processes that occur during metals distortion when they are welded by the explosion. The computations he supervised on the basis of special modelling equations made it possible to predict an important mechanical effect – the formation of a flooded jet of the welded metal component, which was confirmed experimentally. Jet theory formed a basis for creating a new method to measure the viscosity of metals at high-speed distortions. While conducting a study with his disciples into solving the problems of computational linear algebra, he has come to a conclusion about the necessity to make essential modification of its basic concepts. He has developed algorithms with a guaranteed exactitude to solve a spectral problem for asymmetric matrices and systems of simple equations. He is a member of the National Committee on Theoretical and Applied Mechanics (1987). A member of editorial boards of the magazines: «Calculus Mathematics and Mathematical Physics», «Siberian Magazine of Calculus Mathematics», «Siberian Mathematical Journal». An honourable professor of Michigan University (1997). The winner of the Lenin Prize (1959), of A.N.Krylov Premium of AS USSR (1972), of M.A.Lavrentyev Premium of RAS (1993), of M.A.Lavrentyev Foundation Premium (2005). He has been awarded with the Labour Red Banner Order (1956, 1975), with the Honour Badge Order (1954, 1981). * Source: Godunov Syergyei Konstantinovich // Rossiiskaya akadyemiya nauk. Sibirskoye otdyelyeniye: Pyersonal'nyi sostav / Sost. YE.G.Vodichyev i dr. - Novosibirsk: Nauka, 2007. - S.70-71. Updated: Wed Feb 27 14:46:32 2019. Size: 10,014 bytes.